Europe has looked inward for much of the past decade, preoccupied first with the Euro crisis, subsequently with migration from the Middle East, and now with crafting a response to a newly aggressive Russia. These challenges are by no means resolved, yet Europe seemed to have gained momentum after Emmanuel Macron’s election in France. And although Angela Merkel’s fourth re-election left a bittersweet aftertaste, she may still have the opportunity to bring European insularity to a close, and to engage with Europe’s most important partner: the United States. The United States has long had a “guns vs. butter” spending debate. It is in this context that President Trump compared the considerable US investment in collective defense to a US subsidy for European social welfare spending. Already President Obama and his secretaries of defense, most notably, Robert Gates, made frustrated pleas to NATO allies to meet more of their fair share of the defense burden. Hillary Clinton would have had to respond to these concerns as well. She would have done so soothingly, rather than aggressively, but the “fair share” issue would have been center stage. Getting allies to fulfill their commitment to spend two percent of GDP on national security is a proxy for a deeper debate about what allies should expect from each other in an era when hard security threats have returned to the European continent, for example in the form of Russian military aggression and information warfare as well as repeated attacks by ISIS. The challenges Chancellor Merkel faces in building a new government exposes how hyperbolic it was to talk about Germany leading the free world against or without the United States. Instead, the Trump administration does represent an opportunity to make Europe autonomous and strong while remaining firmly anchored within the Atlantic alliance. However, Germany needs a new model for its role in Europe. Germany might see itself as Europe’s humanitarian superpower, but now it is time for Germany to spend more on defense to address both conventional and emerging threats. Beyond spending on capacity, Germany needs to shoulder more of the responsibility on specific missions, especially regarding the European periphery. Germany should also continue to take a clear position towards Europe’s most troublesome neighbor. The final form of the new government notwithstanding, the departure of the SPD from the coalition presents an opportunity to further bolster Germany’s stance against Russian aggression. Ending support for the Nord Stream II pipeline can make Eastern Europe less dependent on Russian natural gas and thereby increase the West’s margin for policy maneuver. In the years ahead, Germany’s relative weight within the EU will grow because of Brexit. The view expressed by President Trump that Germany has used the rules of the EU to its advantage is also widely held in Southern Europe, and not merely in Greece. To be sure, Germany has reformed its labor market in a way neighbors such as France have not, and made considerable efforts to ensure export competitiveness. Yet German exports have been the main beneficiaries of structural imbalances in Europe. The euro has been a boon for the German economy. Acknowledging these realities and supporting eurozone reform to make the euro more stable, for example, through a dose of financial transfer, will strengthen German leadership in Europe. The Chancellor will face resistance from the liberal Free Democratic Party and her own Christian Democratic Union, both wary of deeper integration. But she should take this opportunity, perhaps her last, to convince the public of the need to move forward. Macron’s reforms of the French labor market and the relative economic improvement in the eurozone will enhance her case. The US is not becoming isolationist. President Trump upgraded efforts in Syria and Iraq. He even reversed his initial instinct and ordered increased US troop deployments to Afghanistan, where Germany’s contingent, the third largest among NATO allies, is deeply appreciated. The US continues to meet its responsibilities within NATO, with a 40 percent planned increase to the US contribution to the Reassurance Initiative in the Baltic States and Poland. But as the North Korean crisis shows, the United States is simultaneously involved in numerous global challenges. In this light, it is hardly unreasonable to expect allies with strong resources, led by Germany, to do more to manage the challenges in their immediate neighborhood. Germany’s harsh criticism of the Trump administration during the country’s electoral campaign does not represent a lasting burden for the transatlantic alliance. These views are amply represented in the United States as well. More to the point, however, the American president himself would not begrudge Chancellor Merkel saying what she needed for re-election. Just as the president’s own tweets are not necessarily settled policy, neither is electoral politicking necessarily policy. As Chancellor Merkel enters her fourth term, the question on the minds of Americans and Europeans is what role she will play on the international stage. Now that the election is over, Chancellor Merkel therefore has a historic opportunity to use some of her political capital for bold measures. 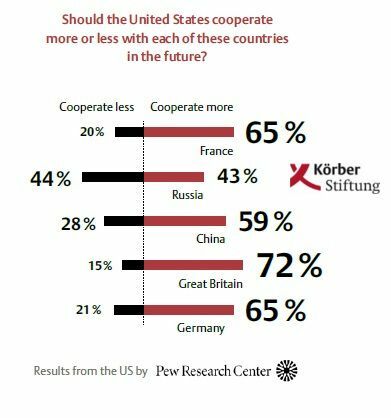 The United States, Europe, and Germany herself need more German leadership, not less. Whether we get what we need is a question that rests squarely in the office of the Federal Chancellor. *Kenneth R. Weinstein is President and Chief Executive Officer of Hudson Institute. He joined the Institute in 1991, and was appointed CEO in June 2005. Weinstein was named President and CEO in March 2011. This article was published by the Hudson Institute.